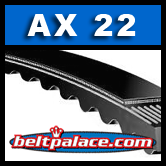 The AX22 belt has a 24 inch outer cir. (610MM OC). 1/2 inch top width and 5/16 inch thickness. Notches molded into the belt during manufacturing make this belt well suited for drives with smaller diameter sheaves.